Your company wants to unite its employees around a project, send them an inspiring message? We organise ready-made stays, combining motivation techniques and relaxation time, built around different themes. 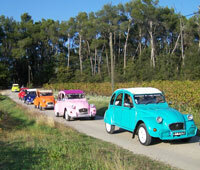 Amongst these we offer you Mediterranean adventures and themed rallies and even Olympics, grouping sport, intellect and games. Your goal is to develop the cohesion of your group, to improve its motivation, its performance and the trust between different members. We offer a framework for bringing out your organisation’s own unique values, through a variety of activities whose common denominator is team solidarity. 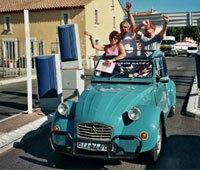 Carefree, rustic and amusing, the old-fashioned charm of the 2CV works on all generations. Out of step with our high-tech age, it inspires fellow feeling, nostalgia and good old-fashioned common- sense behind the steering wheel. 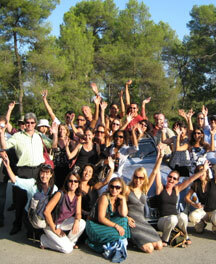 This allows the creation of the ideal event for motivating and rewarding your best teams. Equipped with a road-book and the route map of the stages, you set off in discovery of the French Riviera: Nice, Cannes, Grasse, Monaco, Saint Tropez, and also the middle and high regions, the Verdon Gorge and Marseilles. Water sports (canyoning, rafting, yachting), treasure hunts, role-playing games, film events and casino evenings can be at the centre of your team-building activities.